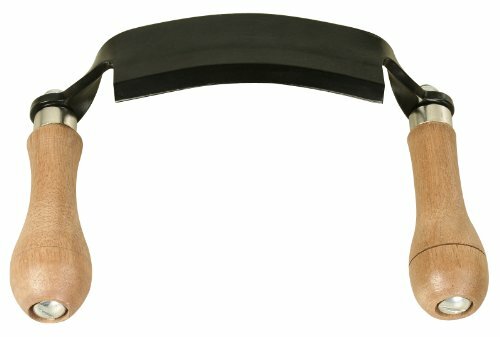 A drawknife has a variety of applications as a specialty edge tool. You can use it to strip bark from tree trunks. It can help perform renovations- trimming and fitting beams or square timbers. And it even has artistic wood-sculpting purposes. Below we review five of the best-selling draw knives- but if you want our top pick right now, it's the Flexcut 5" Draw Knife. Buyers say that the rigid blade and handle provide exceptional stability. The blade was ultra-sharp right out of the box and deynamic enough to cut cloth and debark lumber. It also comes with an attractive leather sheath. Applications range from crafting wood spoons and decoy hunting ducks, to skinning bark from hardwood poles. A drawknife (also known as a draw shave or shaving knife) is a hand tool used in woodworking that is generally used to shape wood by shaving. These specialty knives consist of a blade with a handle on each end (Source). Unlike most carving and whittling knives where you push the knife away from your body, the draw knife works by drawing or pulling the blade toward you. These knives are useful for shaping wood before detail work is done or for removing bark from trees or logs (Source). When buying a drawknife, many users seem to prefer the smaller blades of 5-10-inches, which gives you more control and allows you to be more accurate with your cuts. (Source). In this section, took a deep dive into these 5 draw knives to see which are best suited for beginners and more advanced carvers. The first knife up is the Timber Tuff TMB-O5DC Curved Draw Shave Tool, which features a curved 5-inch blade with comfortable wood grip handles. This is a decent beginner draw knife although some buyers noted the blade didn’t arrive sharp from the manufacturer and that once sharpened, it didn’t hold an edge long enough. The Lumberjack 10-inch draw knife is made from a higher grade steel than the previous knife, and users say this helps it hold an edge longer and remain more durable. The handles are made from urethane, which makes them more durable than wood, although some say they’re not as comfortable to hold over long periods of time. This tool is made in the USA and buyers noted the manufacturers provide exceptional customer support. The Ox-Head QX3752500 is another knife with a 10-inch straight blade. This knife is made in Germany from high-quality German steel. Buyers noted the wood handles are ergonomic and comfortable to use for long periods of time. Most users agree that this is a perfect knife for de-barking logs and smaller woodworking jobs. The Flexcut is another draw knife with a 5-inch blade, although this one is flexible and is said to be better adapted to a variety of projects. Like the Lumberjack we looked at, this knife is also made in the USA from high-quality steel. The small blade is better suited for light woodworking jobs and users say the blade was plenty sharp upon arrival and held an edge for a long time. Last up is the Timber Tuff TMB-08DS Straight Draw, which lies between the others we looked at featuring an 8-inch straight blade. This blade is set at a 30˚ angle which is best for fast woodwork where accuracy is essential. The wood grip handles are ergonomically designed and very comfortable when using for long periods of time. Despite being made in China, most buyers said the quality was good enough for a beginners knife and that it performed well for the price. 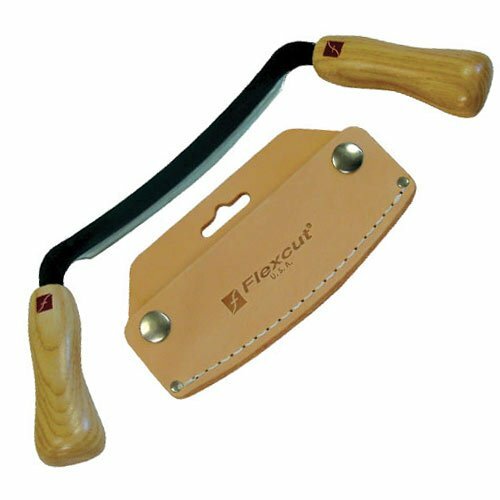 The Timber Tuff Curved Draw Shave Tool is a solid option if you are looking for a tool which shaves bark and wood accurately with little effort. Users like the construction of this product, but do complain about the necessity to sharpen it. This product is a draw knife with a sharp 5” curved blade, 5 mm thick and with a 30° angle for fast and accurate work. It is designed with a long-lasting and durable steel blade with a hardness of HRC 30. 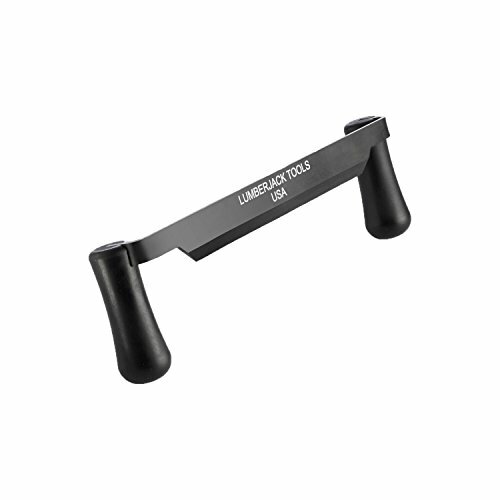 Its wood grip handles are comfortable and provide you with a secure hold. This item seems like a solid choice if you want to easily shave wood from logs, wood, fence posts and more. The general user consensus concerning the Timber Tuff Straight Draw Knife is that it is a well-made tool with proper angle of the handles. They praise its sturdy construction and comfortable grip. However, buyers complain about receiving a knife which is not finished well. As they share, it doesn’t come sharp out of the box. One dissatisfied buyer complains about the blade guard which is just a simple strip of rubber that doesn’t hold to the blade at all. The Ox-Head Straight Drawknife is a good option if you are looking for long-lasting sharpness in a tool. Users love the functionality of the knife, but some do complain about the finish of the blade surface. This product is made in Germany from special quality tool steel. Its cutting edges are finely polished for the best cutting performance. It features ergonomically-shaped riveted hardwood handles. This draw knife could be a good choice if you need a tool for debarking logs. In general, users have a favorable opinion of the Ox-Head Straight 10’’ Draw Knife. They agree that it is sturdy and well-shaped.Satisfied buyers say that it holds the edge from repeated use and that it feels good to use in the hand. However, some buyers complain about the finish of the blade surface and hence the sharpness. One purchaser says the blade he received had numerous nicks. In addition, he complains about the handles which were cheaply made and cheaply attached. The Flexcut Draw Knife is a good option for a craftsman who wants to save time that would otherwise be spent arduously scraping and sanding material away. Users love the sharpness of this product but do complain about its flimsiness. This product features 5 inches of workable edge. Its flexible blade conforms to projects as needed and its two ergonomic ash hardwood handles provide a solid grip. It comes with a sturdy leather sheath. This draw knife might be a good choice if you want one that is specially designed to flex around contours and accommodate concave or convex surfaces. In general, users have a favorable opinion of the Flexcut5’’ Draw Knife and they agree that it is well-honed and razor sharp. Plus, they find the size and the curve to be perfect. Buyers also appreciate the leather sheath/holster since it makes the knife safe to store. However, some purchasers complain about the blade being a little flimsy. One purchaser shares that both wooden handles on his product came off after a few hours of use. If you are looking for a top-rated draw knife, you might want to consider this one offered by Lumberjack Tools. Users love the sharpness of this product but do complain about the plastic handles. This product is made with premium tool steel for superior, long-lasting sharpness. It features ergonomically designed urethane handles which are impervious to oil, dirt, water and extreme temperatures. This item could be a good choice if you are looking for a draw knife with a good control over wood shaving. In general, buyers are very pleased with the Lumberjack Tools 10’’ Draw Knife. They state that it works great. Users add that it has a razor sharp edge which it holds for a long time. However, some buyers complain about the plastic handles, stating that they aren’t as good as wooden ones. As they say, the handles tend to slip a bit through your hands. 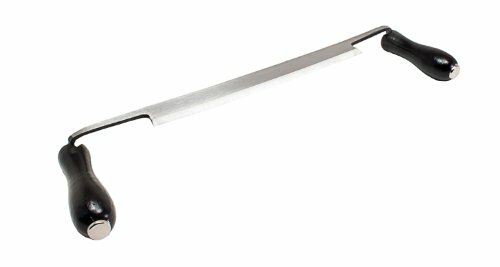 If you are looking for a draw knife, you might want to consider the Timber Tuff 5’’ Curved Draw Shave Tool. Users like its performance, but do complain about the lack of sharpness. This product features a 5” ultra-sharp blade which is 5 mm thick with a 30° angle. The blade is made of durable HRC 30 hard steel. It comes with an included blade protector which keeps the blade sharp and protects the user. If you are looking for a reliable tool for your debarking needs, this might be a solid option. In general, users are happy with the Timber Tuff Curved Draw Knife. They like that it is sturdy and straight, and they also praise its smooth action. They conclude that the quality is appropriate for the price. However, some buyers complain about the fact that you need to sharpen it yourself before getting down to work. Others complain about the material of the blade (not hardened steel) which causes it to chip and not hold an edge. What's So Special About These Knives? Also known as a shaving knife, a draw shave or a drawing knife, a shaving knife is a conventional hand tool used mainly for woodworking purposes. It does this by shaping a piece of wood into sculptures by slowly and patiently removing wood shavings using the sharp edge of the blade. A typical example is made up of a sharp blade with a grip handle on both ends. The dimensions of the blade are such that it is longer along the cutting edge as compared to the deepness (from the back edge to the cutting edge). It is 'drawn' or pulled toward the artist, which is what gives it the name of 'draw knife'. Traditionally, a typical blade of a draw shave has a length of about 23 centimeters (9.1 inches), although you have the option of getting a shaving knife that are smaller in length. The blade of a drawknife is usually sharpened to a chisel bevel. The handles on either side of it can be beneath the level of the blade, or on the other hand, they can be at the same level as the blade. 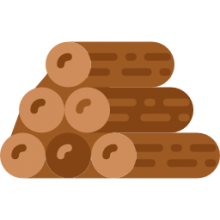 The normal application is to use it to remove big slices of wood to be able to sculpt flat surfaces, or to debark trees or to form roughly cylindrical or rounded billets for extended work on a lathe. It can also be used to shave wood similar to a spokeshave plane, in which the finer finishing is of less priority than finishing the work faster. The thinness of the blade makes it easier to form and design complex and complicated convex or concave curves. However, the difference between a shaving knife and a spokeshave is that it does not comprise of a closed mouth to finely control and design the formation of chips, and thus, it is inferior when compared to a spokeshave, which has a much better ability to shave and cut wood with precision and accuracy. These edge tools are also essential to create hand-crafted cricket bats, as it helps a lot in forming the curves at the edges of the bat. The best way to use one of these carving tools is to use it from a seated position besides a conventional shaving horse, which allows you to harmlessly and firmly grip the working stock. Furthermore, the artist/sculptor can add further power to their pulls by using the strength of their legs. The best type of working stock is designed in such a way that the grain of the wood runs parallel to the shaving horse and is perpendicular to its blade. In this way, it can be used to shave apart the entirety of the wood fiber and also does not cut against it. The ideal way to use it is to not pull the blade completely perpendicular to the wood stock. Instead, it has to be pulled a bit upward towards them at a skewed angle (at a slight diagonal) or in a slithering manner, in such a way that a lot of wood is not taken off, instead, it is slowly and gradually shaved away. In this way, the woodworker can patiently and gently lever the blade in such a way that it 'bites' into the wood and this allows the user to precisely control the depth of the cut by lowering or raising the handles as it is slowly pulled towards them.